The most organised individual is sure to appreciate the simplicity of our Mop and Broom Holder. 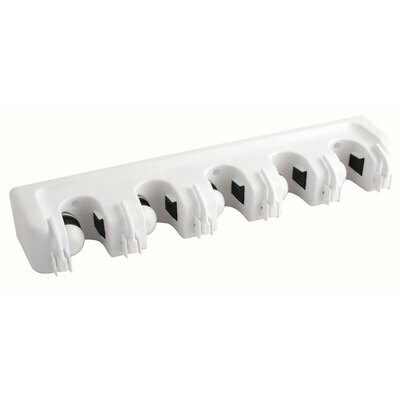 Designed to bring about order in your janitorial cupboard and maximise the space you have on offer, this durable holder is made from a HDPE material. Easily wiped clean with antibacterial wipes, it has a clean white finish to blend in with your existing decor and mounts to the wall in minutes. Holding up to 5 mops or brooms at any given time, it has a build in spring-loaded ball and pad mechanism which grips each handle securely to prevent slipping or dropping. In addition, this broom holder tool features 6 drop down hooks where additional items can be stored including aprons or cloths. Never run out of the essential items in your janitorial cupboard with our wide range of products on offer from Mops to Brooms and all at exceptional wholesale prices.